As a birth doula and postpartum doula at Rock the Cradle, I get to meet families that are going through a huge life event: BIRTH. Yes, birth is transformative on so many levels to all involved: mother, baby, partner, and the community around them. When pregnant, most of us spend a fair amount of time learning and getting ready to birth and finally meet our baby. But we often forget that the part that follows deserves equal preparation. The first hours, days, and weeks after your baby arrives are truly magical. And also, for most parents, extremely challenging. Our healthcare system offers one check-up at six weeks’ postpartum. This is what most people in our culture know about when they think of postpartum care. 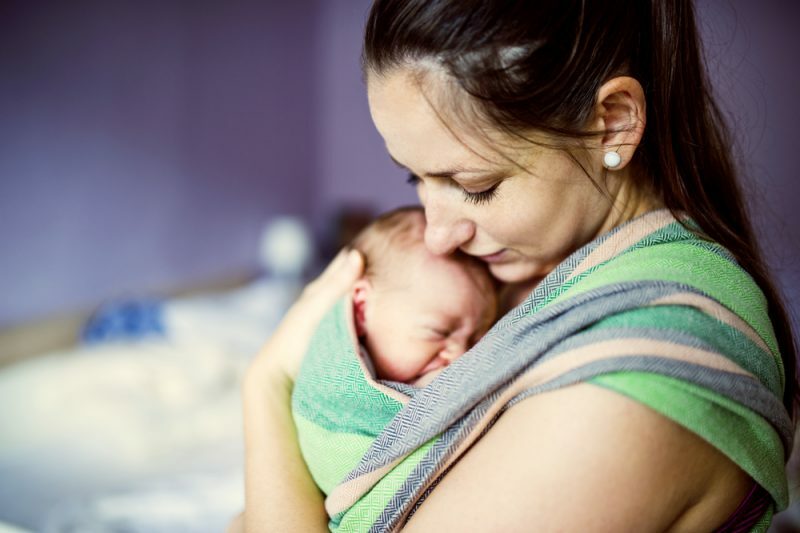 Most mothers who have been through it would probably agree that this falls far short of what they may have needed to have a positive and empowered postpartum experience. The basic need of the Mother to be held and supported during those first few steps of her unique motherhood journey, giving her the time, space, and energy to rebuild her strength, and to bond and fall in love with her brand-new baby. When we address this need, we create fertile ground for her to build her confidence and develop her independence as a Mother. The period of time we call postpartum starts the moment your baby is born and lasts around six weeks. It takes about six weeks for your uterus to return to its place in the pelvic bowl, and around the same amount of time for your perineal tissues to heal. There is so much happening at the same time! In short, the moment the birth ends, the process from being pregnant to not being pregnant begins. Both the body AND the emotions are wide open after giving birth. And it takes time for healing and closure to happen. Following the birth of your placenta, your uterus contracts and hardens, gradually returning to its natural size. (When there’s no baby in it, the uterus is about the size of a pear.) Then there’s typically two to seven weeks of Lochia, vaginal discharge containing blood and uterine tissue. Your uterus is healing; your belly muscles are healing. Your body’s hormonal flow creates and reacts to dramatic changes during the first several days’ postpartum. This is a big topic for another post, but suffice it to say, these hormonal fluctuations have a huge effect on your moods and overall emotional state. On top of all this, you have a new tiny person to take care of! Your new sleep “schedule” has you waking every two or three hours to feed your baby. If you’re breastfeeding, in the first few days and weeks you’re learning how to breastfeed together with your baby. You’re falling in love and taking care of your baby, constantly listening to his or her specific needs. You may also have other children to attend to, and other responsibilities.You are most likely exhausted! Lately I’ve been hearing more and more people who have given birth say that postpartum really lasts a lifetime. The first few weeks after you birth your baby are the foundation for a positive beginning of this new chapter in life, and they set the tone for years to come. During a recent postpartum visit with a family whose birth I attended, the father told me that after their first child was born, they had a to-do list. However, they ended up never checking off any of the tasks on the list. “I went back to work,” he said, “and we didn’t achieve anything.” (Luckily, here in Quebec most fathers can be home for the first few weeks after their baby is born.) This time around with their second child, he was interested in being more productive and checking things off that list. The mother disagreed. She felt that they needed to simply take every day very slowly and focus on taking care of her baby and themselves. As their doula, I proposed that rather focus on a to-do list, that they create a TO-BE list instead, to bring more clarity to their family and understand their expectations of one another. To be nourished: eat wholesome food that is prepared and served to you. To be rested: get plenty of rest and sleep whenever possible. To be supported: obtain breastfeeding support, if needed. To be comforted: receive postpartum massages so you may feel rested and your body feel tended to. To be validated: have opportunities to tell and process your birth story in a nonjudgmental, safe space. Have a trusted person to mind the baby so that you can sleep, take showers and sitz baths, or spend time with older siblings. Ensure that all household chores are taken care of: laundry, organization and cleaning of the home, grocery shopping, etc. To be loved: say yes when people want to help you; this is how they’re showing their love for you and your family. It’s not a sign of weakness! If you want to put a checkmark next to each item on this list, many people will need to be involved. It does indeed take a village to support a newborn mother. Planning in advance—before you give birth—to be cared for in this way can help ensure that you truly have the support you need in the postpartum period. p.s. We want you to #LoveYourBirthStory! Join our growing community of parents who birth and parent with confidence! You can find us on YouTube, Facebook, in our private Facebook group ‘This Motherhood Journey’, on Pinterest and Instagram.